Contains natural well known anti-inflammatories. Provides analgesic and anti-inflammatory effect. Possesses beneficial properties for arthritis pain. 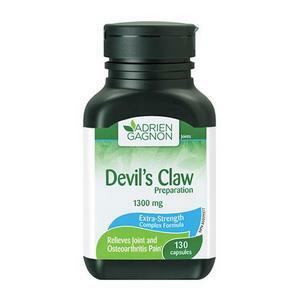 Devil’s claw is scientifically renowned for its analgesic and anti-inflammatory action, especially on lower back pain. Its efficacy at relieving arthritis pain is also supported by clinical studies. The other plants in this product all possess beneficial properties for arthritis pain that are recognized by the European Scientific Cooperative Phytotherapy (ESCOP) such as black currant, queen-of-the-meadow and horsetail which are all traditionally used for rheumatoid complaints. White willow bark is effective at relieving lower back pain while Linden has a soothing property. Finally, angelica is traditionally used to treat gastric ulcers, which may reduce the potential adverse effects of devil’s claw.